Why You Should Join UcheTechs Telegram Channel Now! Telegram is really a good social media for sending and receiving end-to-end encrypted messages. When you chat with your friend or business personnel, all your conversations are not saved or stored for third-parties to read. 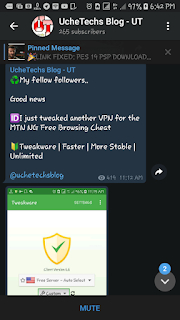 This is one reason, UcheTechs cherishes Telegram Apk and I have provided reasons why you should join other Followers of Uchetechs.com. This is not the time t dull, this is the time to smarten up and act fast. We created this channel for the sole reason of Updating you guys with our latest posts and updates. 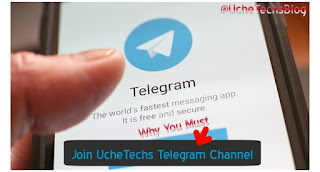 UcheTechs Telegram Group with more than 2.1K members is still there because our channel has an Aim. Why not join Our Telegram Channel where you can know what our latest posts and Updates are. You don't need to keep scrolling on the Group Unlike our Telegram Group where you have to keep scrolling and because of the number of messages from our Active followers, you can't find our latest Update. This can be really annoying and stressful. Recently, I have been having Private chat from users asking me to either Pin or Tag a specific article on the Telegram Group. So for this reason, I have listed out some benefits of joining UcheTechs Telegram Channel. 5. NEW: We now have a poll where you can select any option we have listed that might be from FAQ. 7. We now post Android and Pc tricks on UT_Blog Channel so that you and I can either remind ourselves or learn new things. 8. Get the Latest Tech News with "Pictures" as a reference for easy understanding. 9. Great Contents to be posted if you act fast! How this convinced you and didn't confuse you, make the right choice now! ... and act fast!